Hondo (or Honda) was born in Nagano prefecture and graduated from the Military Academy in 1910. He was a 1917 graduate of the Army War College and was a lecturer in the Infantry School. He became vice chief of staff of China Expeditionary Army in 1939. Hondo commanded 8 Division in Manchuria when war broke out. 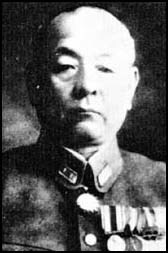 Shortly thereafter he became the chief of the Japanese Army's armored warfare department. He became commander of 20 Army in Manchuria in 1943 and of 33 Army in Burma from its activation in April 1944. As such, he was the Japanese commander in northeast Burma during the Myitkyina campaign. He executed a brilliant evacuation of 56 Division from under the noses of the advancing Chinese on 4 February 1945. Rushed to Meiktila after Slim's hook maneuver across the Irrawady, Hondo's forces failed to arrive in time or recapture the city. Twice he barely escaped having his headquarters overrun by advancing British troops. His scattered and broken army was ordered to retake Rangoon, but he refused the order, declaring that his force was capable of nothing more than delaying tactics. He was reputedly a womanizer and fond of fishing and sake. He was somewhat scholarly and known for his correct personal conduct. Though not particularly gifted, he was a conscientious officer. He was unusually thoughtful towards his enlisted men, and liked to tell dirty jokes to raise their morale.